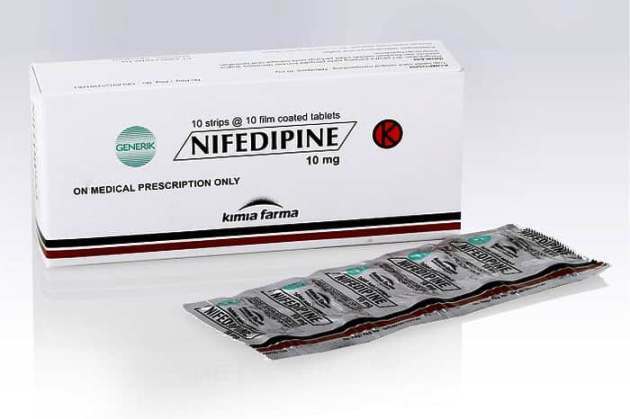 Nifedipine side effects and doses – Nifedipine is a drug with a function to prevent certain types of chest pain (angina), and hypertension. This remedy enables you to more exercise and reduce the frequency of angina attacks. Nifedipine belongs in a class of drugs known as calcium channel blockers. These drugs work by relaxing the blood vessels so that blood can flow more easily. This medication should be used regularly to be effective. This drug should not be used to treat attacks of chest pain at the time. Use of other drugs (such as sublingual nitroglycerin) to relieve attacks of chest pain as recommended by your doctor. Consult a doctor and pharmacist for more information. Nifedipine works by inhibiting the amount of calcium in the cells of the heart and blood vessels. This condition will dilate the blood vessels, thereby increasing the supply of blood and oxygen to the cells of muscles, including the heart muscle, as well as lighten the workload of the heart. Patients with impaired processing of sugar in the body, such as lactose intolerance, not recommended taking nifedipine. Avoid the use of nifedipine in heart failure patients. Use with caution in patients with cardiomyopathy. Careful use of elderly patients, because it can cause hypotension. Notify doctor that drugs routinely consumed, including supplements and herbs. The dosage of these drugs is influenced by various factors, i.e. what diseases arising, whether there is a history of allergy to this medicine, a person’s body response against this drug, as well as other diseases that can react if consumption of the Nifedipine drug. Initial dose: 10 mg per oral 3 times a day. Treatment dose: 10 to 30 mg per oral 3 to 4 times a day. Initial dose: 30 to 60 mg per orally once daily. Maintenance dose: 30 to 90 mg per orally once daily. Older people dose: 5-20 mg, 3 times per day. The initial dose of 5 mg, 3 times per day. Advanced dose: 10-20 mg, 3 times per day. 10-40 mg, 2 times a day or 30-90 mg, once a day. Initial dose for older people: 5 mg, 3 times per day. All drugs must have side effects, but not all people will experience these side effects. Effect of CV (cardiac function, depression, hypotension, worsening heart failure, bradycardia); Palpitations (irregular heart rate); Tachycardia (heart rate when resting above the normal limit); myocardial infarction; angina. Extremities: peripheral edema; Myalgia (muscle pain). CNS effects / Neurology: headache, dizziness; Vertigo (spinning headaches); Migraine (side headache); Tremor / seizures. HR set the calcium antagonist (such as Diltiazem, Verapamil and Gallopamil); decomposition of AV, AV block, bradycardia & sinus stem disorders. Dihydropyridine agents short interaction should be avoided because it has the potential to raise the risk of worsening the heart condition. Pruritus (Itching at all parts of the body). Hyperplasia of the gingiva (gum swelling). Gynecomastia (increased bre**ast size in men). Allergy: itching, rash, stevens johnson syndrome, erythema multiforme, exfoliative dermatitis. Rash, including Erythema (redness of the skin caused by dilation of vessels). If the Nifedipine side effects persist even worse, immediately discontinue its use and consult a doctor. Read also: My head hurts: 42 Causes. Thank you very much for reading Nifedipine side effects and doses, hopefully useful.